Do you remember the coldness after swimming on a hot, dry day, then getting out of the water and feeling the wind brushing your wet skin? Or simply dip your finger in a glass of water and then blow it, through your finger you will feel a cold sensation and you will notice how the water evaporates. It's evaporative cooling. Evaporative cooling units recreate this natural process and provide a constant flow of fresh and refreshing air in a hot and uncomfortable environment. When in the first half of the last century Air Conditioners began to advertise for Hotels and Restaurants there were already traditional air conditioners (Evaporartive coolers), and had been in use for many years. The early evaporation units are known as "swamp" because of the high moisture content released in the air from primitive technology. While the current generation of evaporative coolers are designed to achieve maximum cooling in exchange for a minimum of moisture in the air, the term "swamp" is still commonly used to describe any type of evaporative cooler. Evaporative cooling units, such as those manufactured by Pars-EcoTech, circulate water through the saturated cooling media while pumping air over the entire surface, hot air absorbs moisture and reduces the temperature of the air discharged into the unit . The heart of an evaporative cooling system is the means of communication, commonly called "pad", where water evaporates and cools and air passes through the pads. The evaporative cooling panels are made of striated cellulose sheets that stick, these sheets are chemically impregnated with special compounds to prevent putrefaction and ensure a long service life. A special water distribution system spreads water on the surface of the pad, ensuring a uniform supply of water to keep the air contact surface completely soaked. The fans create a negative pressure, causing air to be pushed through the pads, resulting from the evaporation of contact between air and water. A control system operates the water pump and the fan distributes the fresh air. The relative humidity is lower in the afternoon when the temperature is at its highest point. And the lower the humidity, the better the evaporation cooling. In other words, the cooling effect is better when you need it most. Coolers and central air conditioners have the same purpose: it keeps us cool. But these two systems work very differently, understanding the difference can help you get the most out of any system and minimize energy. 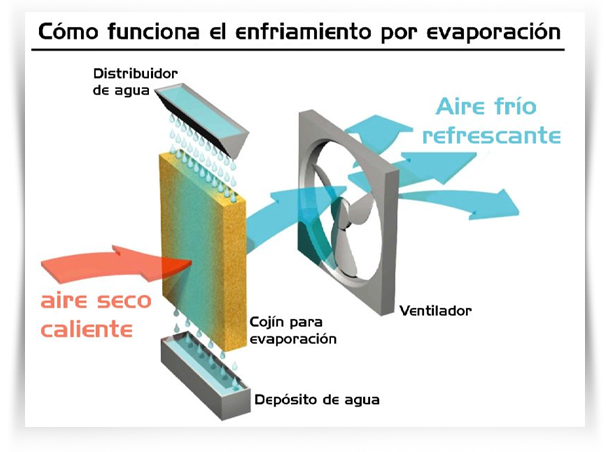 The evaporative cooling systems work best when a small amount of outside air circulates in the space where the evaporative cooler is used, this also introduces fresh air into the environment and increases the quality of the indoor air. The Centralized Air Conditioners take moisture from the air, these systems produce cold and dry air and work best in an airtight environment. The main advantage of an evaporative cooler is that its operating costs are much lower than those of a traditional air conditioner. The initial cost will depend on the size of the unit and the size of the area to be cooled, it may also be lower than air conditioners, and there is a low installation cost. Together with the lower unit and operating costs, evaporative cooling can also be a perfect and respectful alternative to the ozone layer. Conventional air conditioners cause dry air to use chemicals that can harm the environment if it is released into the atmosphere. 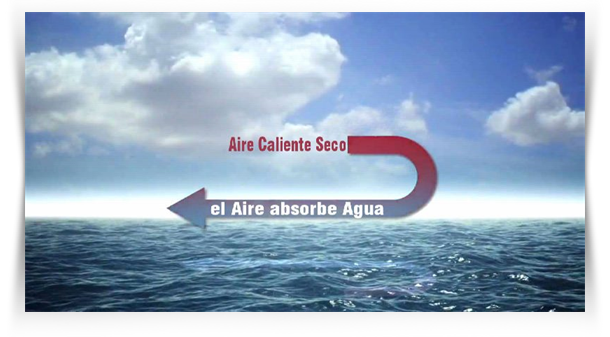 Refrigeration by evaporation, however, is based on a totally natural process of air cooled by water, which means it does not dry the air, does not irritate the skin, throat, or eyes and does not affect the environment. Evaporative cooling is one of the healthiest ways to cool down because it replaces stale air with clean, fresh air in a very short time. Remember that you will keep your doors and windows open, the air is renewed, removes bad odors and germs airborne. So, the question is, can a cooling technique that has been around for centuries be effective in this high-tech society like today's? Not only can it provide effective cooling solutions but it can do so without damaging the environment without chemicals that deplete the ozone layer. That sounds like a smart choice for anyone.